Martin Lorenzo couldn’t understand it. The food service director for Gateway School District knew more kids were eligible for the free breakfast program, but they weren’t taking advantage of hot meals provided in the high school cafeteria. Meet kids on their own turf by placing grab-and-go carts stocked with healthy breakfast items at convenient spots throughout the school. 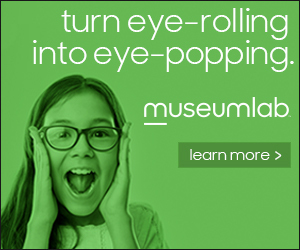 Moveable carts, called the Cruising Cafes, set up where kids are most likely to Grab-and-Go a healthy breakfast. 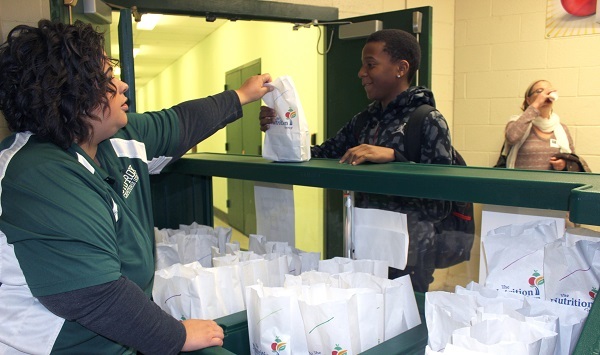 The Grab and Go breakfasts carts are a pilot program of Allies for Children, a non-profit organization that advocates for the well-being of children in Allegheny County. Funded by a grant from the Henry Hillman Foundation, and implemented through the Greater Pittsburgh Community Food Bank, the food carts have been successful in five school districts. Gateway saw an increase from 159 to 276 participants in 2017-18 from the previous school year. At Sto-Rox Junior/Senior High School last year, 203 students used the grab-and-go carts, an increase of 54. West Mifflin High School went from 153 to 193 students. Participation at South Allegheny Middle/Senior High School increased from 186 to 235 students. North Hills Middle School served 55 students in 2017-18 after just three students took advantage of the program the previous year. In 2016, Gov. Tom Wolf set a goal to ensure that 60 percent of Pennsylvania students eligible for free or reduced-cost lunch were also served breakfast. Earlier this year, the governor’s School Breakfast Initiative provided $900,000 in mini-grants to school districts in the commonwealth. The Grab-and-Go program serves a critical need in Western Pennsylvania. According to Just Harvest, 43,000 children in Allegheny Country – about 18 percent – face food insecurity. 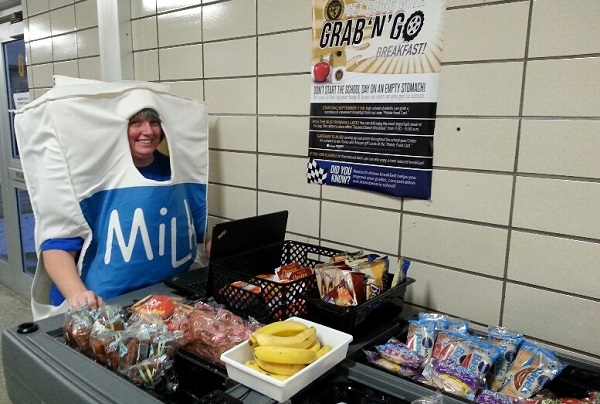 Ms. Deb at Gateway School District has a little fun promoting Grab-and-Go breakfasts. 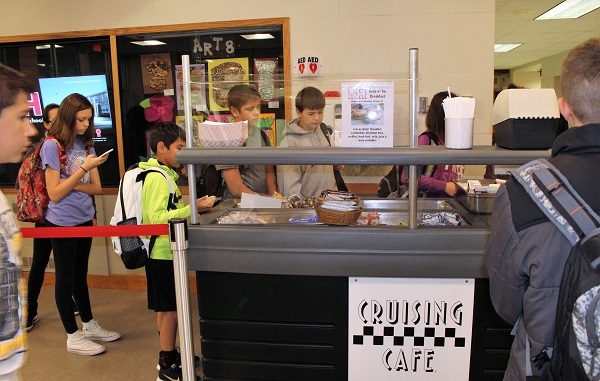 At Sto-Rox, the breakfast carts are placed at strategic locations throughout the school. Food service director Nancy Hatton says that nutritional options are emphasized, with whole-grain blueberry and chocolate muffins the most popular items. Fruit, yogurt with granola, and cereal are also available, and the menu changes frequently. Dowd thinks the increased participation may be partially due to mitigating an age-old problem: the embarrassment some kids feel because they rely on free meals. Lorenzo agrees that sometimes students avoid free or reduced meal programs. “In their minds, school breakfasts are only for poor kids,” he says. The grab-and-go carts have mitigated that stigma at Gateway. Pre-made breakfasts at Sto-Rox allow kids the chance to eat healthy on the run. But at Sto-Rox, so many students are eligible for the program, there’s no stigma attached to accepting free breakfasts and lunches, says school superintendent Frank Dalmas. They may not want to stand in line in the school cafeteria, but they have no problem getting food from the carts. 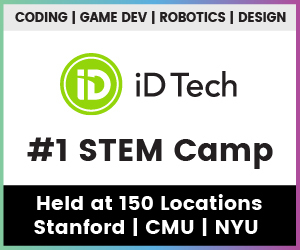 To increase participation, Sto-Rox offers promotions, too. Rege Behe writes about books and authors, music and musicians, in Pittsburgh and beyond.